Next in my Superhero conversions, cyclops! I started with the Revell Aztec running with the shield and obsidian weapon and cliped the weapon and shield arm off. I next used greenstuff to make his goggles and shoulderbelt. I attached the bent arm from the Aztec naked slinger. 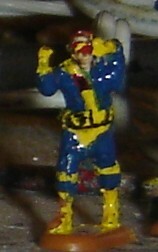 I painted it with a basecoat of blue, then painted the goggles yellow and then then red. I then painted his knees and gloves and boots yellow and his groin/shoulderbelt, belt also yellow. I then painted black stripes on the belt and a black sunglasses pack on his shoulderbelt.